Collecting art is no less individual than creating it. Like many appreciators of fine art, I am both insatiably curious and admittedly intimidated by contemporary art. My latest breakthrough on the contemporary art front is that I am overthinking it! Going back to the words of my Painting 101 professor at the Memphis College of Art, “Let go, and lighten up!” Art is about exploration, not definition. This conclusion is based on advice I recently received from David Lusk, who is well-known in Memphis for his extensive gallery collection of Southern and contemporary art. As of this month, David has two galleries: David Lusk Gallery (DLG) opened its doors to the Nashville community on March 1 in the burgeoning Wedgewood/Houston neighborhood. Here are five characteristics of contemporary art with examples of each, courtesy of DLG, to help us interact with this challenging art genre. 1. Contemporary art comes in all shapes and sizes. Tad Lauritzen Wright is a game player who creates art in all shapes and sizes. He hopes, through his art — one-line drawings, word finds, instructions, shuffleboard tables, skateboards, paint-by-number collages, appropriation imagery and the like — that viewers will spend quality time with his works, not just take a cursory look. All shapes and sizes: Tad Lauritzen Wright pet rocks, which were giveaways at the March 1 opening reception in Nashville. All shapes and sizes: Dammit by Greely Myatt, plaster and cedar, 7x6x3, 2012. Part of the current DLG Nashville exhibit, Opening. 2. Contemporary art can be playful or have a more a serious tone. A life-changing experience provided Kathleen Holder with her quest of expressing the energy, intuition and forces that shape individual lives into her work. Layer upon layer of pastel color is built up and burnished by hand into what Holder has called psychic, abstract landscapes. Each piece, while exceedingly minimal in tone and composition, has great depth of both color and form and, as we are observing today, emits a serious tone. 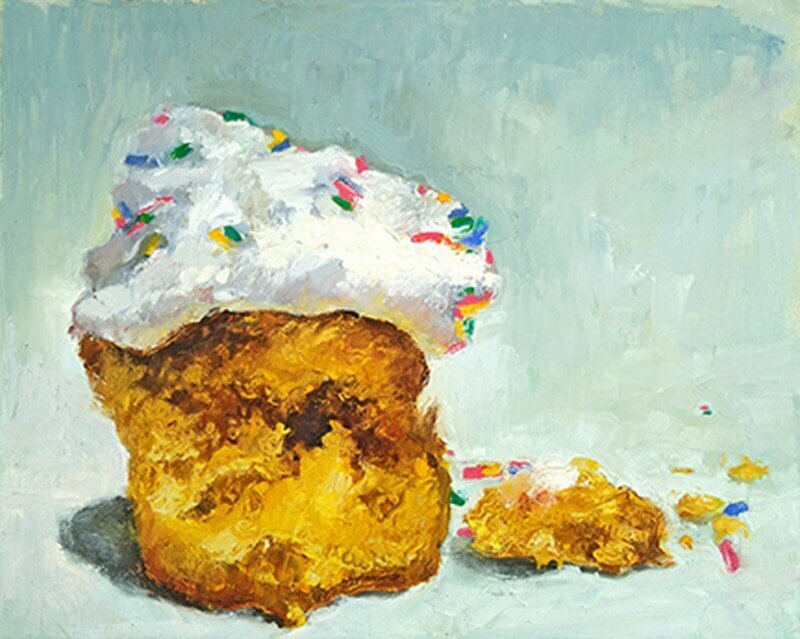 Leslie Holt captures not only the playful tone of a child’s birthday party, but also the complex feelings of a party coming to an end in her most recent body of work, “Help Yourself.” The depiction of highly texturized hunks of cake, frosting and cake crumbs are intensified by a thick application of paint. 3. Contemporary art reflects the present time, addressing issues relevant to our daily lives. 4. Contemporary art is usually a representation of the artist’s personal experiences. 5. Contemporary art is often a study of pure shape and form. Masking tape, rulers and X-acto blades are only a few of the tools that Mark Bradley-Shoup uses to create his works on paper and canvas. Photographs of urban and rural landscapes are deconstructed to build up texture and emphasize certain angles and colors. The result is a work void of any photorealistic qualities — that effectively plays with negative space and flat geometric shapes to infer issues of our economic culture. These five off-the-cuff characteristics are simple guidelines for navigating contemporary art. If you hope to start or build on a collection, or just want to bring color and texture into your home with a meaningful piece of artwork, jot this list down for your next contemporary art exploration. Lighten up and enjoy!